"Hi there, I am the real, live Sadie. 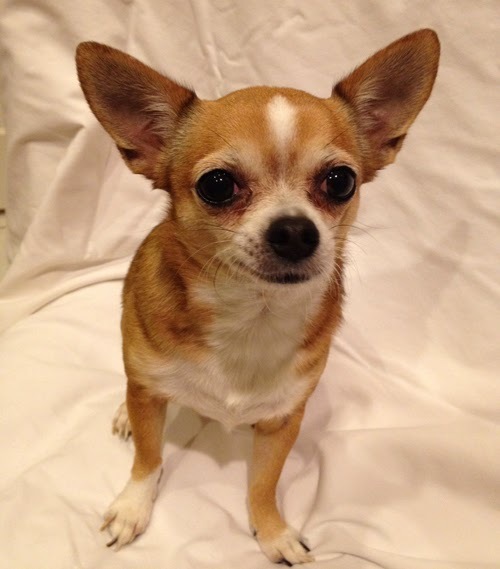 I’m a rescued Chihuahua and I live in Tallahassee, Florida with Jeff and Jacki Bauer. It occurred to me that if you are visiting my website for the very first time, you probably want to know how I came to be designated as 'the world’s most intelligent dog.' Well, it comes down to three different factors: First and foremost, DNA (better known as scientific luck-of-the-draw), which of course provided the most important ingredient; secondly, a human companion named Emma, who recognized my learning potential and taught me how to speak, read, write and use the computer. And finally, it was my human pack leader who put it all together, author Jeff T. Bauer, who chronicled my story for the world, in the novel that bears my name, SADIE SAPIENS. If you're intrigued and would like to know more, please click on 'My Novel' tab that is located above.